Do you want to experience the best football and stadium atmosphere in the world? Then you should visit Camp Nou during a home game with FC Barcelona. 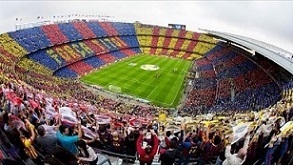 Camp Nou is the largest stadium in Europe and has a capacity of 99.354 spectators. Camp Nou is also home for one of the largest Nike stores in Europe, packed with FC Barcelona Products. If you want to buy more affordable football souvenirs there are usually several stalls selling sweaters, scarves and much more outside the stadium before and during football matches. Tickets for home games can be expensive and run out quickly so it is important that you book in time.